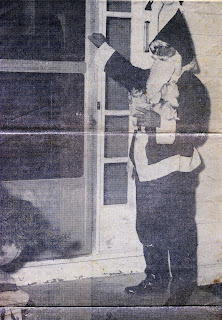 “Jim started playing Santa Claus when we first got to Aurora, just for the neighbors. He kept on doing it more and more all his life. 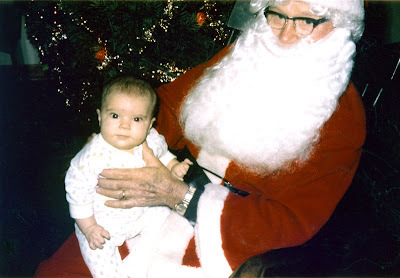 He played Santie Claus almost every year that I can remember.” —Myrtle Greer James T. Greer as Santa holding his granddaughter Carrie. This photo was taken in 1971, six years after the Aurora Branch became Fox Valley Ward. Myrtle continues: “I made him a suit and a cap and he bought a beard. He loved any chance to be with people and do things with people, or to please people. Every year he went from door to door around here in his Santa Claus suit, to every child on this whole street and give them something for Christmas. Jim saw that everybody in the branch had something for Christmas too. There wasn’t very many of us then. “He had his presents in his car and his Santa Claus suit on going over to take a present to the Wendts. On the way he stopped at a stop sign and somebody run into him. Two or three cops come, and they were marching up and down, and the man was cussing and said Jim stopped and caused him to have a wreck and all. It was really a mess. Of course, Santie Claus was out there a dancing around with his suit on too. If you live in the neighborhood of Foran Lane, you may hear a knock on your door. When you answer it, it won’t be a door-to-door salesman for a commercial product. It may be a door-to-door salesman of kindness and the Christmas spirit. It my not be December; it may be June or January. There’s a 70-year-old gentleman who symbolizes for many Aurorans the spirit of giving and peace on earth all year round. Children love James T. Greer, a year-round Santa Claus, even if he’s dressed in around-home casual clothes. They call him grandpa. Adults are proud to call him friend. Each year at harvest time, his front yard is like a farmer’s market; the children are in his corn cart, pulled by Greer’s tractor. His hobby is making lamps. He makes them out of anything at hand. During the holiday season, he dons a Santa Claus suit. He goes around the neighborhood, knocking on doors, and residents are given an unsolicited gift.